After armed attackers staged a bloody assault that killed 62 in an upscale mall in Nairobi, the Kenyan government said on Monday night its forces had secured the Westgate Mall and that all hostages had been freed. As it has been doing over the course of the three-day ordeal, the government used Twitter to communicate the latest news on the standoff: “We believe all hostages have been released. Special forces and KDF soldiers combing the building. 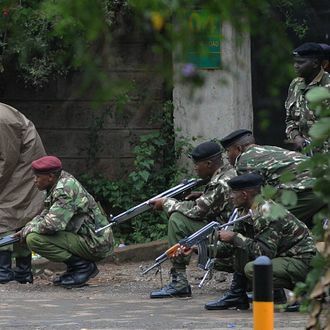 Situation of hostiles to be confirmed,” tweeted the Kenya National Disaster Operation Centre. However, the government made similar assurances on Sunday, and at dawn on Tuesday explosions and gunfire were heard coming from the mall, and a body was carried from the building. Turning to a more traditional medium, Foreign Minister Amina Mohamed shared new details about the attackers on PBS’s News Hour several hours earlier. She said the group includes “two or three Americans,” who are 18 to 19 years old and of Somali or Arab origin, who have lived “in Minnesota and one other place” in the U.S.“One Brit,” is also said to be among the attackers, a woman who “has, I think, done this many times before,” said Mohamed. A State Department spokeswoman told the Associated Press the department had “no definitive evidence of the nationalities or the identities” of the attackers. “That doesn’t mean it’s not true. We just have no information to go on,” one unnamed official told NBC News. At least three attackers were killed as Kenyan forces moved in on the mall, NBC reported. The government said another ten had been arrested for questioning. But the New York Times cited witnesses who said some of the attackers may have escaped in the early stages of the operation, blending into a fleeing crowd. So even if the actual hostage standoff is over – or at least coming to an end – the process of bringing the perpetrators to justice may just be beginning.